I’m an unapologetic fan of the Adnams Brewery as I’ve described before in these pages – the brewery’s Southwold Bitter is one of my “desert island beers” – so I was keen to try both its expressions: Adnams Single Malt Whisky No.1 (43% ABV) and Triple Grain Whisky No.2 (also 43% ABV). But it’s also important to contain my enthusiasm and be as objective as possible in evaluating the products. First off, the whiskies have only three years in oak to their names, the minimum to be labelled whisky in the UK. Expecting huge depth and complexity is therefore a bit of a stretch. Moreover, Adnams has no whisky-making pedigree, as such, making their purchase a bit of a gamble. Especially given that the £43.99 price tag will also buy a Port Charlotte or a Glen Grant 16 year old, among others. Still, I knew what I was buying so parking these considerations for now, what do we have? My immediate response to the packaging was positive, the blue and pink of the two young whiskies complementing the unique bottle design. The blue also has a familiar look of Bruichladdich about it, unlikely to be deliberate but potentially a bonus. Whether the bold colours will still seem like a good choice twelve months from now I can’t say but for now they certainly draw one’s attention in store. Moving on to the contents of the bottles. Adnams Single Malt Whisky No.1 (blue) is double distilled from a 6% wash made from malted East Anglian barley before aging for three years in new French oak barrels in Adnams’ cellars. 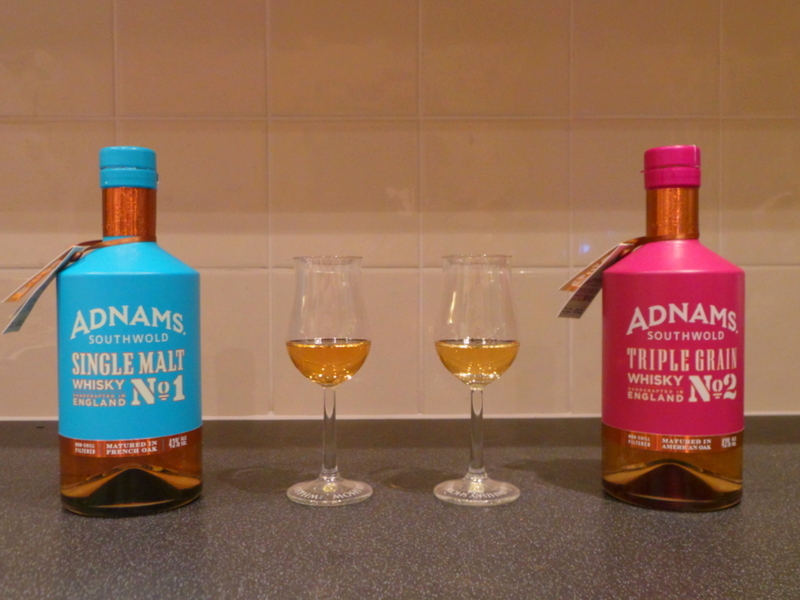 Contrastingly, Adnams Triple Grain Whisky No.2 (pink) is also made from a wash of 6% alcohol, but this time from a mix of malted oats, wheat and barley, before spending three years in new – but un-charred – American Oak. So what’s the verdict? As expected, both whiskies are somewhat straightforward at this stage of their development. But it’s also clear that they are very well distilled, with no unpleasant feinty or overly solvent-fruity aromas. Nor are they too influenced by the new oak, a good indicator that they will age well. For now, both are a little spirituous and perhaps a bit raw on the nose, the No.1 offering a little camphor, butter and vanilla while the lighter No.2 has some melon and rose water notes. On the palate, No.1 is remarkable in its fidelity towards its origins, the rich biscuity flavours of malted barley almost overwhelming. No.2 is perhaps sweeter (though neither is sweet) and definitely lighter, though the oily, porridgey character of its oat content tales a back seat to a continuation of its gentle fruits and flowers theme on the nose. Different, yes, but definitely from the same mould. Products such as Adnams’ whiskies aren’t meant to compete directly with their Scottish, Irish or North American cousins. Rather they offer alternatives to the norm, offering different approaches and new flavours for enthusiasts who are prepared to pay for the experience. As they become more accepted they will no doubt also help provoke their older brethren into greater innovation, as new wave breweries have to the beer establishment. For Adnams, the boot’s on the other foot this time. 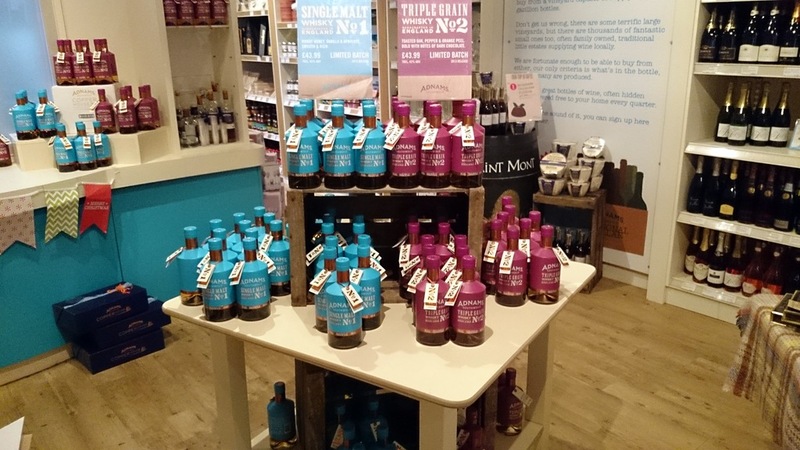 Distribution of Adnams Single Malt Whisky No.1 and Triple Grain Whisky No.2 is through Adnams Cellar & Kitchen shops and website. With only ten barrels of each whisky laid down initially in 2010, stocks are clearly limited with another batch not due until late 2014. I’ll be following their ongoing development with considerable interest.